I fell in love with Pamela Clare's writing with her modern-day romantic suspense I-Team series, but I had no idea how much I would enjoy her historical romance series MacKinnon's Rangers. The MacKinnon brothers -- Iain, Morgan, and Connor -- are Scots living in the wilds of 1750's New York. I loved Iain's and Morgan's stories ([b:Surrender|656836|Surrender (MacKinnon’s Rangers, #1)|Pamela Clare|http://d.gr-assets.com/books/1298611983s/656836.jpg|642925] and [b:Untamed|3711150|Untamed (MacKinnon's Rangers, #2)|Pamela Clare|http://d.gr-assets.com/books/1325216112s/3711150.jpg|3754715]). This is Connor's story. British Lord William Wentworth has pressed The MacKinnon brothers into service to fight the French by holding a death sentence over their heads for a crime they didn't commit. Not surprisingly, the brothers hate their commander -- especially Connor. Now it's Connor's turn to lead the highly dangerous and effective MacKinnon's Rangers. Don't underestimate him just because he's the youngest brother. His stature and skills demand respect. When the Shawnee capture Wentworth's niece, Lady Sarah Woodville, Wentworth orders Connor to save her. Connor takes his trusted friend Joseph on the rescue mission. When Connor tracks down Sarah, his low expectations of Wentworth's kin get blown to pieces. Sarah is exquisitely beautiful, innocent yet brave. Unfortunately the Shawnee's best warrior has decided to take Sarah as his bride in order to avenge the English killing his wife. The only way for Connor to get her back is to fight to the death for her hand in marriage. But oops! How will Uncle Wentworth feel about his royal niece marrying a lowly Scot? NOT HAPPY. Like his brothers, Connor is swoon-worthy -- tall, tanned, with long brown hair and deep blue eyes. He's funny, honorable, and competent. Connor's unique burden is the rage and guilt he carries for hurting innocents in this unending war. He believes he's damned and undeserving of good things in life. I knew I would love Connor but I had no idea how fond I'd grow of Sarah. Her strict parents had tried to squelch her passion for music, which is her most endearing quality. When Sarah gets embroiled in a scandal in England, her parents send her away to America without bothering to allow her to defend her innocence. A fine-bred lass such as she is clearly not ready for the uncivilized land of colonial America, but she doesn't complain once. She has strength beyond measure. "If my touch doesna sicken you, then why do you draw away from me?" Trapped by her own undeniable response, she looked into his eyes, saw his anger and, beneath it, anguish..."I do not feel repulsed by your touch. I feel..."
Oh, how could she speak of this with him? "I feel...confused." Heat rose to her cheeks. "They way you look at me...I feel...naked. I struggle to breathe. And when you touch me...I feel warm, even when it is cold, and still I shiver." Ashamed, she started to look away, but he caught her chin between his fingers, forcing her to meet his gaze. He seemed to study her for a moment, the anguish slowly leaving his eyes, his voice deep and warm. "There's a name for what you're feelin', Sarah. Do you ken what it is?" Sarah shook her head. She was not sure she wanted to know. "Connor, I--"
She shook her head, took a step backward. "Nay, I--"
"Shall we put my supposition to test?" He pursued her in slow, easy steps, drew her into his arms. Only when she had finished the entire sonata, the last notes lingering in the cool evening air, did she realize what she'd done. She opened her eyes. Every Ranger in camp was staring at her, even Connor, a look of stunned surprise on his handsome face. Was he angry? Reluctantly, she lowered the fiddle, feeling uncertain. She hadn't meant to play so long. The music had simply rushed out of her, almost beyond her control. She was about to hand the violin back to Dougie, when the Rangers burst into wild shouts. It took her a moment to realize their shouts were cheers and meant as praise. When the cheers had begun to quieten, Connor spoke, his voice strangely soft. "I've ne'er heard such beautiful music afore, my lady." 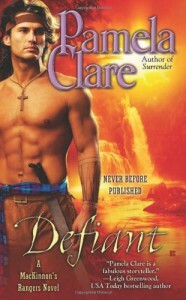 I'm so grateful to the author for sending me a signed copy of Defiant, which I won in a giveaway. And I hear this series may have another novel featuring Joseph. 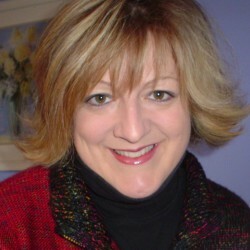 Until then, I have more Pamela Clare novels awaiting me. Yahoo!